This is one of those acclaimed pasta sauces that only takes as long to cook as the pasta does, the kind of dish I normally ignore in favour of long, slow-cooked ragus. I’m glad I stopped ignoring this though because I really enjoyed it and would happily eat it again tonight. The combination of the tomatoes and cream create a rich sauce, not unlike a ragu in some ways but with an altogether lighter finish. Although this isn’t an Italian recipe with a particularly long history, there are many variations on the recipe available. Chilli flakes are a common addition and would be a good way to balance the sweetness and, of course, pancetta would be perfect. We used San Marzano tinned tomatoes, these seem to be naturally sweeter than other brands of tinned tomatoes and therefore don’t need to be cooked as long. You can find them in Sainsbury’s, under the Taste the Difference brand. If you’re using other types of tinned tomatoes then you might want to increase the cooking time. Start by slowly softening the onions over a low heat until they are almost brown – about 10 minutes. Add the garlic and cook for a further two minutes. Next, add the tomatoes and season with salt and pepper. Cook for five minutes before adding the vodka and cream. Remove the garlic clove, stir in the parsley and add the pasta. Grate with parmesan and serve. 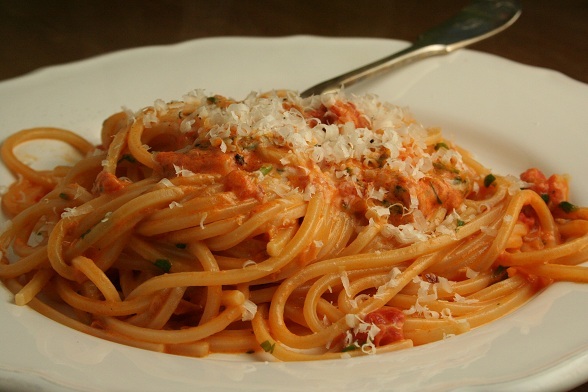 Subscribe to comments with RSS	or TrackBack to 'Spaghetti alla Vodka'. This looks delicious, and perfect for the small dribbles of vodka I have left. .-= Lizzie´s last blog ..Drakes on the Pond, Surrey =-. Thanks, Wizzy. It was very comforting, without being too heavy which is great for this time of year. Good point, Lizzie, I hadn’t thought of that! I’m glad you liked it, Cass. I don’t know why it took me so long to get round to making it either. I tried this but used passata, it was great!